German mystic of the seventeenth century; friend and correspondent of Manasseh ben Israel. He was a nobleman and the most influential personage in the district of Oels in Silesia. A disciple of Jacob Böhme, he said: "The true light will come from the Jews; their time is not far distant," etc. He also wrote: "Hebræi habent fontes, Græci rivos, Latini paludes" (cited by Grätz, "Geschichte"). He wrote to Manasseh ben Israel on the coming glory and salvation of the Jews; and his mystic writings undoubtedly influenced his countrymen. 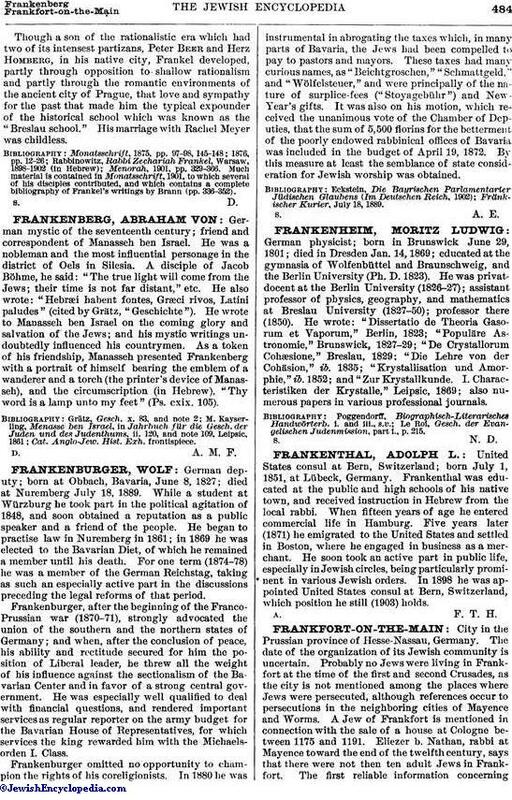 As a token of his friendship, Manasseh presented Frankenberg with a portrait of himself bearing the emblem of a wanderer and a torch (the printer's device of Manasseh), and the circumscription (in Hebrew), "Thy word is a lamp unto my feet" (Ps. cxix. 105). Cat. Anglo-Jew. Hist. Exh. frontispiece.